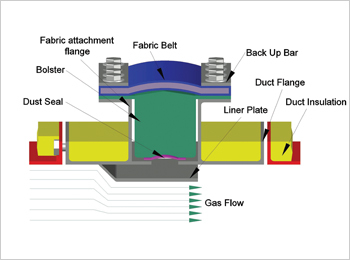 As described by Fluid Sealing Association-USA, “Non-Metallic/Fabric Expansion Joints are flexible connectors designed to provide stress relief in ducting systems by absorbing movements caused by thermal changes. They also act as vibration isolators, shock absorbers and in some instances to make up for minor misalignment of adjoining ducting or equipment.” Fabric Expansion Joints are typically designed for ducts where pressure is know, not more than 3 psi (2000 mm w/c) and temperature up to 1000oC. However, for higher temperatures, duct itself needs to be internally insulated. A technical joint venture has been signed with Senior Flexonics Pathway-USA, who is globally known in the field of expansion joints. We bring to India their experience of over 50 years in this field. Today, Urja is registered and regularly supplying to prestigious organizations like BHEL, EIL, NTPC, RELIANCE, TATA, L&T, GAIL, IOCL, MRPL, GSFC, IFFCO etc. etc. Chimney seals, Vibration Isolators for industrial fans, Reformer Tube Insulation, Gas Turbine Insulation, Welding Blankets, Cable Protection Sleeves, Valve Jackets etc. are also supplied by Urja. Metallic Joints develop cracks which cause drop in pressure and temperature. This requires frequent maintenance which is time consuming and costly. NMEJ’s (Non Metallic Expansion Joints) can be installed over the metallic joints very fast. This saves loss in temperature and helps maintain pressure. 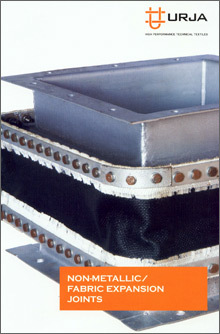 NMEJ’s are more resistant to corrosion as compared with metallic joints. Copyright © www.urjafabrics.com 2011 | All rights reserved.